To anyone who is fortunate enough to call Pitlochry their home, its appeal is evident. But, as we know, Pitlochry has a broader charm – a bustling holiday destination and a ‘must-see’ part of Highland Perthshire, boasting everything you need for a great day out. To meet the needs and expectations of those looking to settle here, or call Pitlochry their second home, Perthshire housebuilders Stephen are creating eight contemporary apartments within their existing development in Pitlochry. As you can see for yourself by visiting the new show apartment (the first, and two others, sold out in record time!) the two bedroom apartments, built in two blocks of four, will complete Stephen’s ‘Lagreach’ development. A choice of two apartments remain available – one ground and one upper floor – with four clients having already settled into their fantastic new surroundings. These popular homes are modelled on similar properties at Balgarvie Mill in Scone, by Perth. All boast highly sought-after private parking, with ground floor units having their own easily managed gardens and garden store. First floor units enjoy a feature entrance porch and benefit from dormer windows in the main living rooms. And when it comes to ‘location, location, location’, and the associated views, these apartments cannot be beaten. These homes enjoy a spectacular and delightful setting under the dramatic skyline of Ben Vrackie with the River Tummel and Loch Faskally at its base. The Lagreach housing development has been designed to complement this setting, only 500 yards from the centre of town yet sitting within its own mature woodland setting adjacent to Loch Faskally. Tom Buchanan, Marketing Manager said, “By building these apartments, we are bringing something quite unique to Pitlochry. 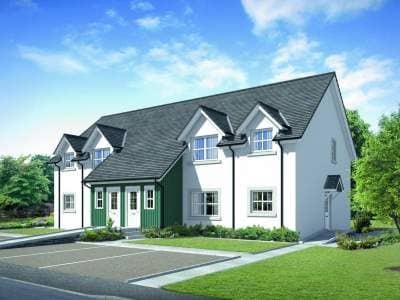 Not only are these modern, high-spec, energy efficient homes but they are set within a prime location, and also just a short walk from the centre of Pitlochry. And if that wasn’t enough, priced at £175,750, the apartments are also eligible for the ‘Help to Buy (Scotland)’ initiative which allows people to put down a deposit of as little as 5% of the selling price, combined with a mortgage of up to 80% of the value of the property. So you pay just 85% of the property price now, and the remaining 15% is provided by the Scottish Government in the form of an equity loan. If you would like to view our new show apartment, please contact our Sales team on 01738 620721, or email sales@stephen.co.uk – we will be delighted to help.